The 2017 NFL Draft class features an incredible amount of first round-talented EDGE players. 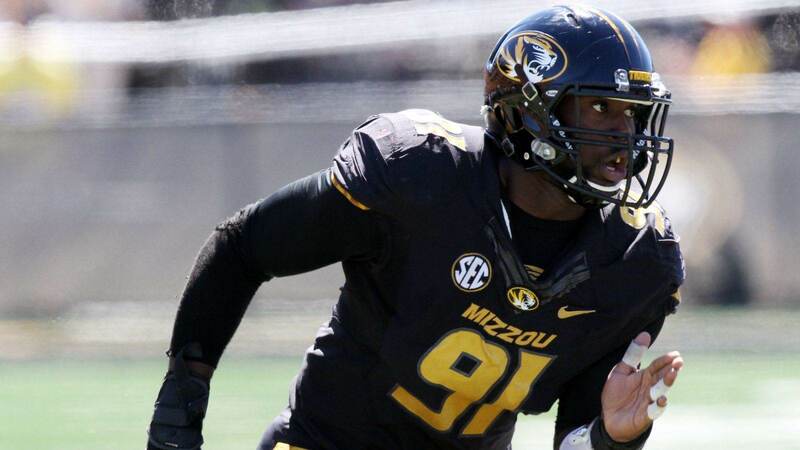 Towards the top of many EDGE rankings is Missouri’s defensive end Charles Harris. When watching Harris, you immediately see exactly why people believe he could be a top 20 talent in this class. However, you also immediately see why he could potentially fall a bit in the draft, going to a 2016 playoff team in the first round, or possibly even survive until day two. Harris, like one of my other favorite EDGE prospects Takk McKinley, is a rather raw talent at this point in his career. Harris possesses an elite, explosive first step which helps him to win when pass rushing as soon as the ball is snapped. After exploding off the line of scrimmage with his first step, Harris is athletic and balanced enough to get around the corner and be disruptive in the backfield. Here we see that explosiveness at work. Harris beats the offensive tackle simply with his first step, and then keeps his balance around the corner while the tackle tries to push down on him. This ability to explode and win the corner is special, and something that NFL scouts look for in every pass rushing prospect. Harris has very long arms and good feet as well, which allow him to be effective both as a pass rusher and against the run. He must better refine both his hand-play and his feet, however, in order to reach his full potential. Harris has to learn how to use his length to his advantage more often to be a more complete player. Charles Harris also needs to add to his pass rushing repertoire. Outside of his simple speed rush and spin move, Harris doesn’t possess many other pass rush moves. While he has the balance and speed to win around the edge at the college level with consistency, he must improve on his technique and block awareness to win in the NFL. He also needs to better convert his get-off speed into power, to avoid being stalemated at the line of scrimmage. When Harris does hit that speed move, though, it is an incredible thing to see. He is so good at setting up the offensive tackle with speed rushes, getting the tackle to overcompensate for his speed, and then hitting him with a spin back inside to make the tackle look foolish. Against the run, Harris needs to gain strength in both his upper and lower body to anchor better against run blocks and become an overall better player. Adding strength should also help his punch, something that was lacking on most snaps against the run. Harris is listed at 6’3″ 255 pounds, which is a decent pass rushing build, but may need to be stronger in order to play the run out of a 4-3 defense. Harris also needs to better recognize blocking schemes. Too often he ran himself out of plays by taking “the easy way out” against run blocks. He would run around the edge, leaving a running lane open inside of the offensive tackle. Increasing this awareness will go a long way to making Harris a three down player in the NFL. I really like Charles Harris as a long-term prospect. He has the explosive first step, length, balance, motor and natural hands that anyone would love in an edge rusher. However, he currently lacks the strength and awareness to be a three down player in the NFL. He made a ton of splash plays in college, but was not a player who consistently applied pressure on the majority of snaps. I have a first round grade on Harris due to both his current abilities and his ridiculous upside. If I was the General Manager for a team picking between 20-32 in the first round, I would not hesitate to select Charles Harris. I would look at Dallas and Pittsburgh as two very likely landing spots for Harris, and think he could be the NFL’s next Vic Beasley-type rusher who explodes in year two.